I have this thing about fabric, no fabric left behind. What am I talking about? Well, if I finish a project and I have enough fabric left to make something else, I feel this incredible need to do that. Now pattern time, I had McCall's 7600 in my collection and thought this would work. It is a knit only pattern but I just went up a size. Let's talk about how I lined this all up. First thing is I did a test stitch out, so I knew the exact size. 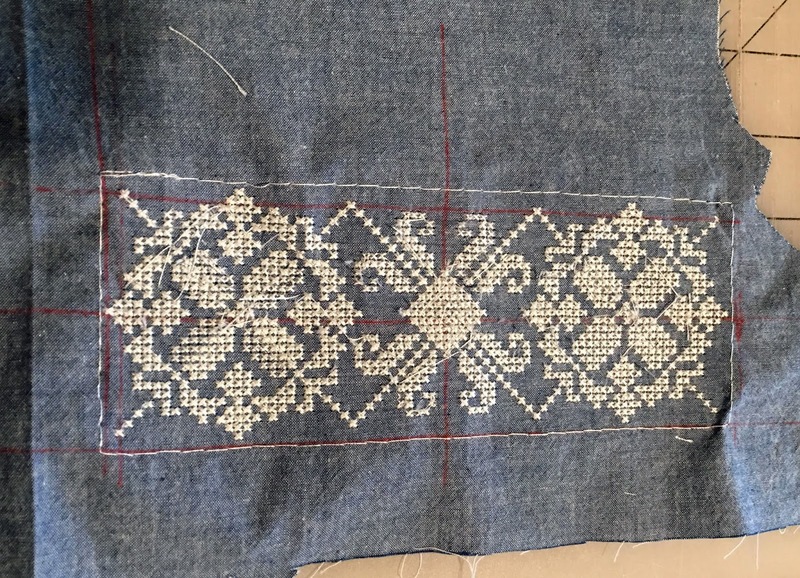 I then took that stitch out and placed it on the yoke, the embroidery bottom edge 1-1/4" from the bottom yoke edge. Pressing a fold in the center front, I placed the edge of the design 5/8" from the CF. I made sure I had the middle (horizontal and vertical) marked on the fabric. These were necessary to place on the corresponding marks on the embroidery hoop. 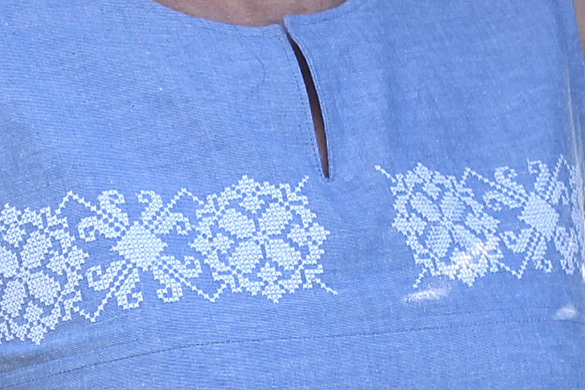 My Pfaff has a baste feature, which is great to show the exact location of the embroidery. I knew the bottom line of basting needed to be on the lower line (the 1-1/4" mark) After that I hooped, basted, double and triple checked and stitched out the first one. That was the easy part, stitching out the second one made me so nervous. I had no extra fabric! 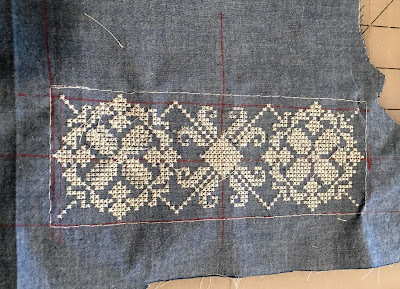 The lines made all the difference and they were the solution for a perfect stitch out. One thing about this the design needed lots of trimming, that took some time. Finally, I wanted a CF slit. The deigns didn't meet in the middle and the slit was a good design feature to "interupt" the design. Plus it made the knit pattern, made from a woven easier to get on. I used facing for the slit and then bias binding for the neckline. I couldn't be more pleased with how this top came out. 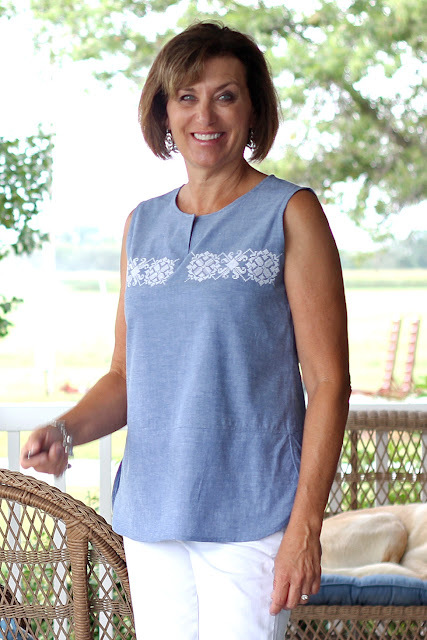 I love the embroidery, the white on the chambray is just perfect, in my opinion. Now my camera on the other hand is giving me fits! I took photos 3 different times. I don't know if it is the lens or the camera but it is focusing on the strangest things. 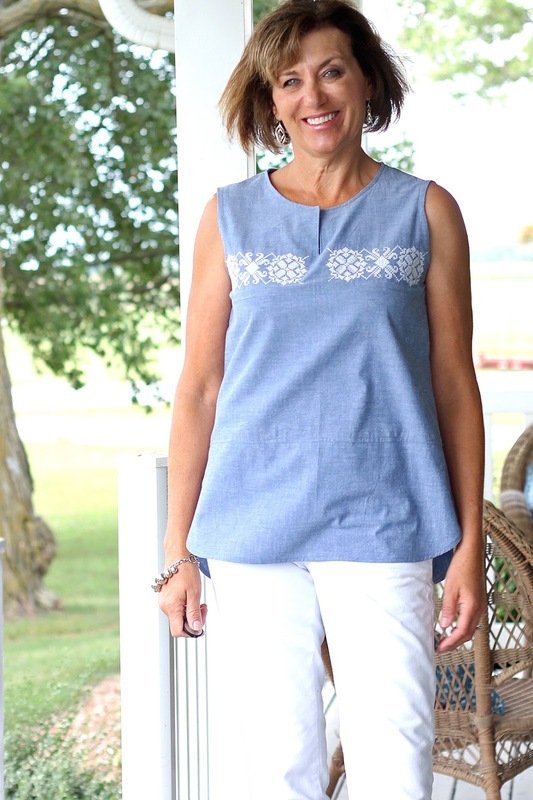 That is okay, I was able to try on this top with three different types of jeans. I have options! 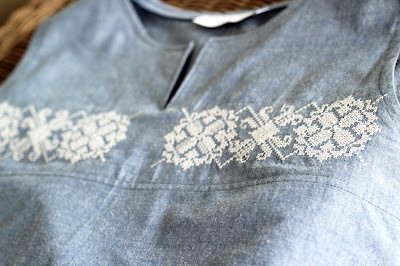 What do you think about the embroidery trend? I can remember having a denim shirt my mom hand embroidered for me when I was a kid. In fact, my mom embroidered one for several relatives for Christmas. Wish I still had that shirt. This has turned out beautifully. I don't have any embroidery ability on my Bernina, so I shall live vicariously through you. 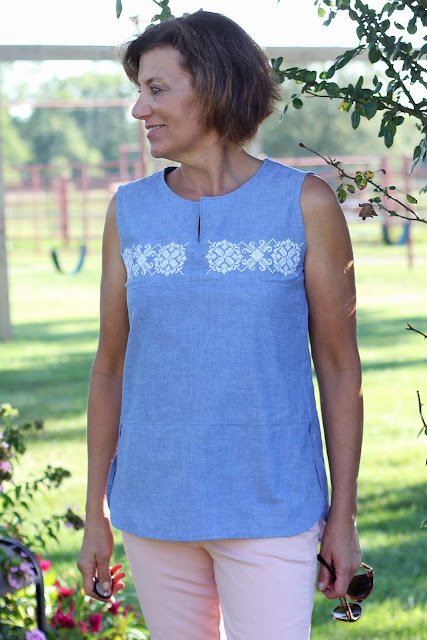 The finished top is fabulous! Thanks, Diane, I am trying to use the embroidery more. Great Top! If I had an embroidery option I would be all over the trend! I can hardly move on to another project until I use that fabric. Beautiful top! The embroidery really makes it. I have the same desire to use up every bit of fabric- it's a fun challenge. That's really pretty Lori! Great job!! This is fantastic! Love how you added the embroidery to the fabric to get what you wanted in a top. 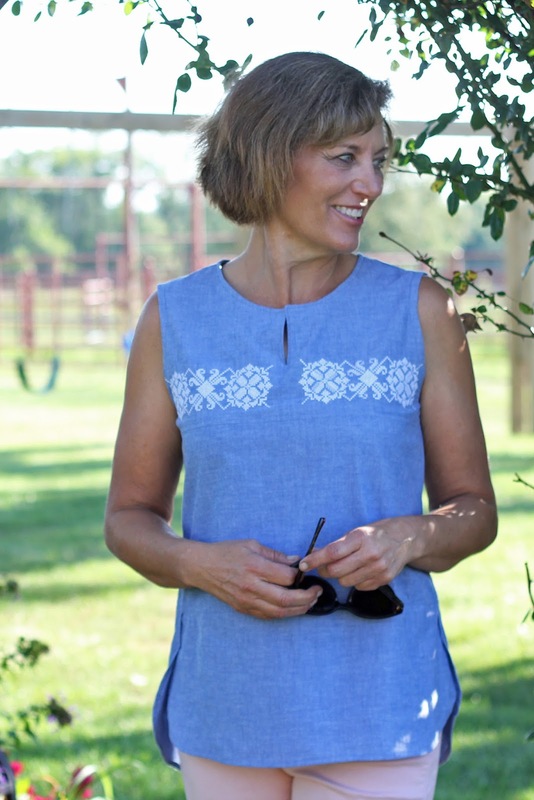 Lovely simple top made on trend with the embroidery. Thanks, it was a fun way to make it more my "own"
This top turned out beautifully! Great choice on the embroidery pattern. Great top! 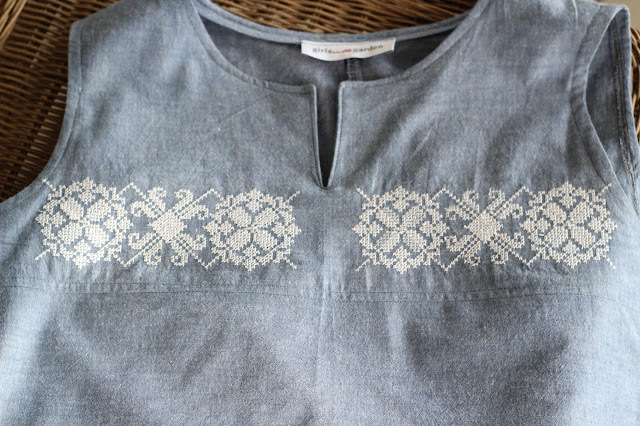 I love it's simplicity and the embroidery really finishes it beautifully. Thank you, I really love this one. I love your blouse, which would have been nice in any case, but is exceptional with the embroidery. 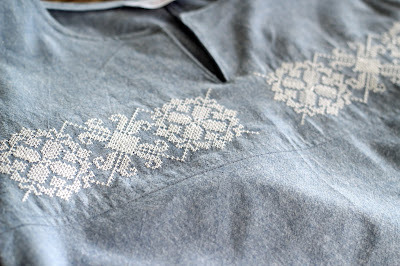 In the 1960's and 1970's, I did a lot of hand embroidery on clothing, and I, too, wish I had hung onto it. You and Sarah Gunn are making machine embroidery very appealing to me, but I am still in the hmm, maybe stage. Thank you for the inspiration. My mom embroidered denim shirts for all my cousins and my brother and myself one Christmas. I was little (1970's) but I remember all her hard work and how amazing it was.